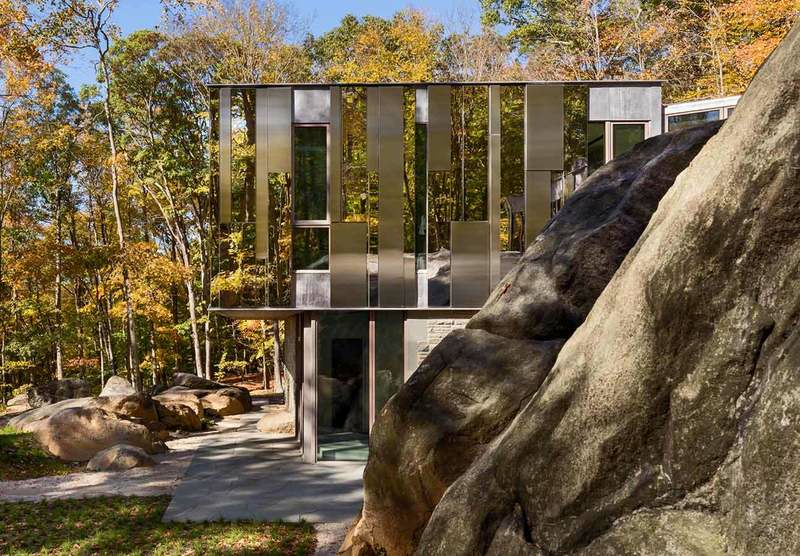 The site for this home is a south-facing, boulder-strewn escarpment that rises over a hundred feet, from a wetland to the top of a ridge. The owners were drawn to the almost magical sense of tranquility they felt upon their first visit to this heavily forested land, striped with loose-laid fieldstone farm walls from the nineteenth century. Their mandate to the architectural team was simple but not simplistic: they wanted to live in a "house in the woods, of the woods"—to feel the presence of the forest indoors—and to commune quietly with nature and visit with guests within naturally lit, open, airy, warm rooms. The first and most important act of design was selecting the place to anchor the home within the steeply sloped glacial terrain. We were immediately drawn to the ridge itself. Just beneath it were two rock-enclosed “rooms”—one positioned below with another space adjoining it above. Separating these was a small ravine, carrying water from a crevice in the ridge to the wetland below.